We take pride in offering a comprehensive range of flooring to customers across the Kent region. Whether commercial offices looking for hard wearing twist pile carpets or domestic homeowners looking for the very best in real wood flooring; we can supply and install almost everything. With a range of flooring products for you to choose from, we have the high quality new carpets, vinyl, laminate or wood flooring that you require. Call us today on 01634 294414 to arrange your free survey and no obligation quotation. Our professional carpet fitters will be on hand to discuss your flooring requirements and will be able to arrange a visit from our mobile flooring showroom! Our designer flooring services are all of the highest quality and are installed by our professional floor fitters. Be it new carpets, safety flooring, vinyls, laminates or new oak flooring, we have the services that are sure to meet your requirements and fit in with the style of your home or commercial property. We employ a team of highly experienced and skilled floor fitters that quickly get your new designer flooring supplied to your property and begin the installation. If you are a homeowner or a commercial property owner looking for a new floor, our floor fitters are sure to provide the perfect solution. 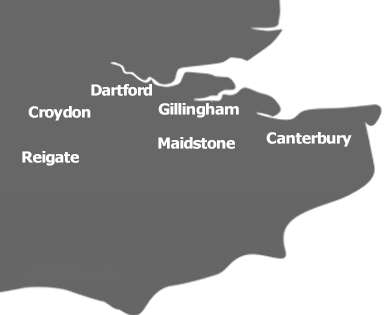 Based in Medway, Kent, the mobile nature of our flooring shop means that we can bring the shop to you across the South East region. With many years of experience installing and supplying flooring and carpets, we also guarantee superb advice in helping you pick out something ideal for your needs. Our floor fitters regularly supply and install flooring across Gillingham, Rochester, Rainham, Maidstone, Medway, Sittingbourne, Sheerness, Faversham, Orpington, Greenwich, Canterbury, Dartford, Bexley, Bromley, Chatham, Ashford, Gravesend, Sevenoaks, Tunbridge Wells and Strood. Whatever kind of flooring you're looking for, contact us today to arrange an installation.